Roy Jones Jr. Boxing Promotions led by CEO/ Co-Founder Keith Veltre and boxing legend Roy Jones Jr will return to Texas on Friday February 9th in association with Montoya Boxing with a stacked triple-header at the Bomb Factory right in the heart of Downtown Dallas. Featured bout of the evening on beIN Sports will see two featherweight contenders as hometown hero, Ray Ximenez 16-1 (4KO) from Dallas Texas takes on once beaten John Vincent Moralde 19-1 (10KO) from the Philippines in the 8-round main event LIVE on beIN Sports Network. 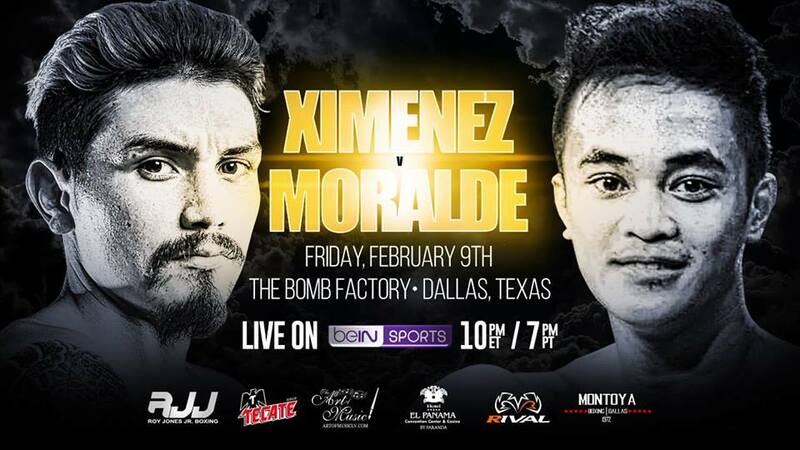 Ximenez, who will be making his third straight appearance at the Bomb Factory in his hometown of Dallas Texas on Friday February 9th on beIN Sports has only fought once in 2017. Ximenez had an outstanding amateur background with over 100 wins and his only professional defeat came in controversial fashion to undefeated Christopher Diaz 22-0 (14KO) last year in Puerto Rico for a WBO regional title. Ximenez is extremely eager to put on a show in front of his Dallas supporters. This former Texas Featherweight-Champion knows he has a difficult task at hand when he faces the much bigger Filipino in John Vincent Moralde. John Vincent Moralde, just 23-years-old will be making just his second appearance in the USA. This former WBC Asian Boxing Council Featherweight Champion who hails from General Santos, Philippines is extremely confident as he prepares for Ximenez. Prior to his last outing which he suffered his first professional defeat, Moralde was on a three-fight knockout streak, two of those three came in the very first round. Co-feature bout on beIN Sports will see another Dallas native, former USA Olympic alternate and undefeated light-heavyweight Adrian Taylor 6-0 (3KO) in a 6-round bout against fellow undefeated and Olympic alternate Aleen Whitfield 7-0 (6KO) from Geneva, New York. These two highly decorated amateurs have their eyes set on the very stacked light-heavyweight division. Opening the beIN Sports telecast will be Ft Worth native and undefeated featherweight Edward Vazquez 4-0 (0KO) in a 4rd bout against an opponent to be named later. Vazquez is quickly becoming a very popular hometown fighter in the DFW metropolitan area. Vazquez also known as “The KID” will be making his national television debut in front of a ruckus hometown crowd on Friday February 9th.